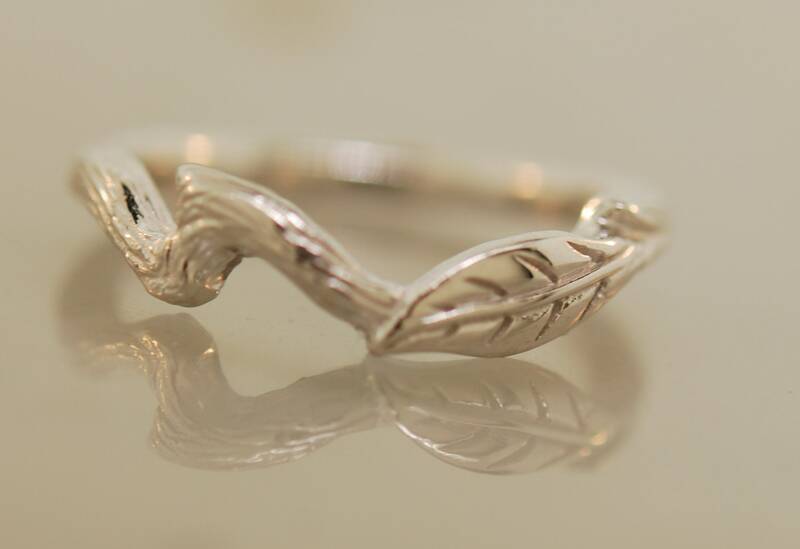 This single leaf set comes with a 4 mm natural diamond. The diamond is SI quality and G-H color. 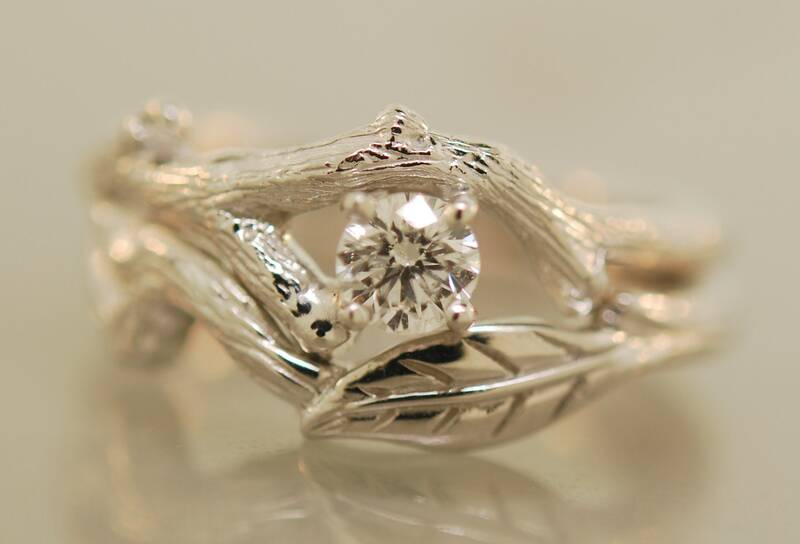 In the sterling silver set the diamond is set in a 14k white gold setting. 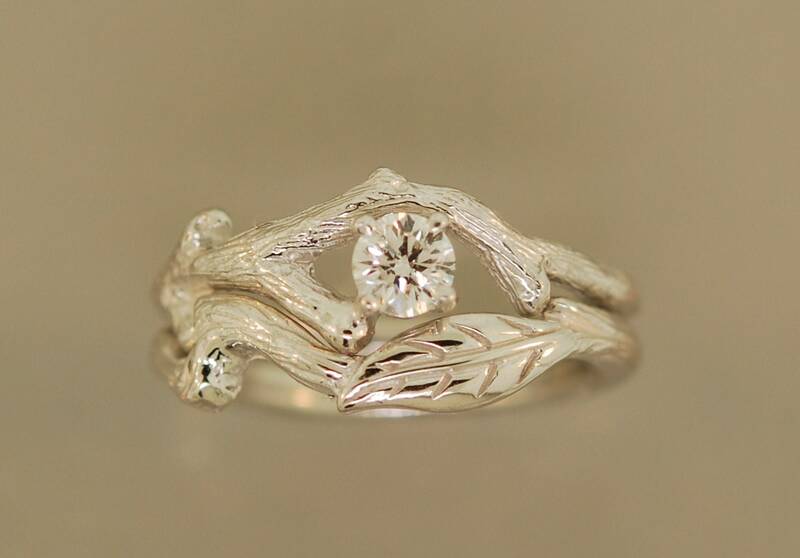 You can also purchase this ring in 14k yellow gold, white gold and rose gold. 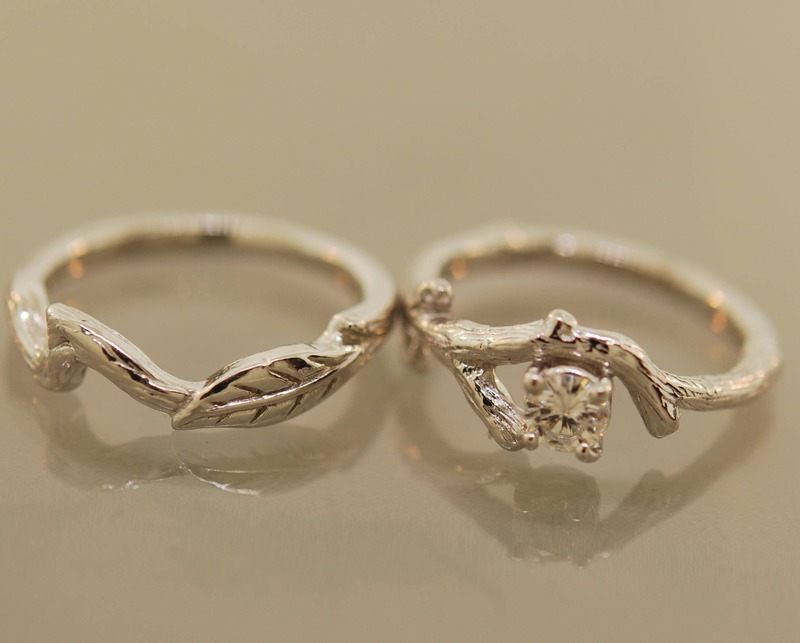 This listing is for both of the rings. 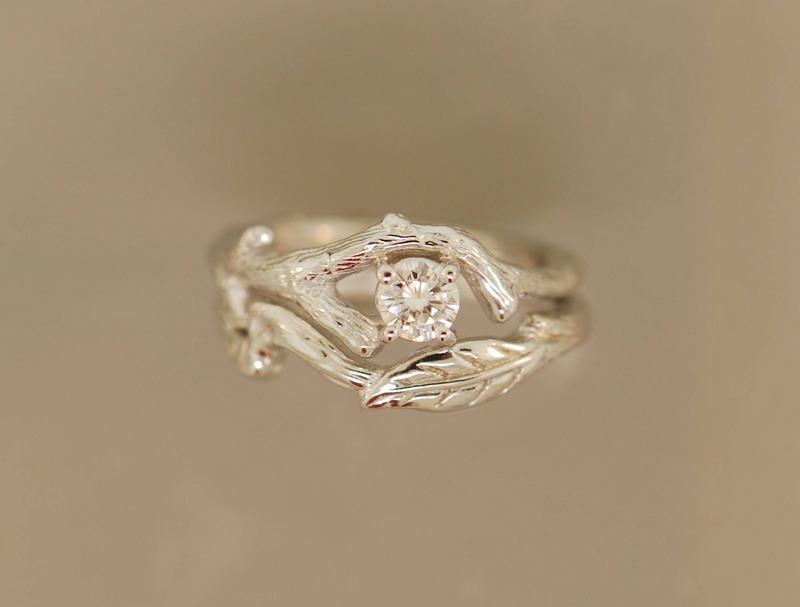 Perfect for those that like something a little different and are inspired by nature. 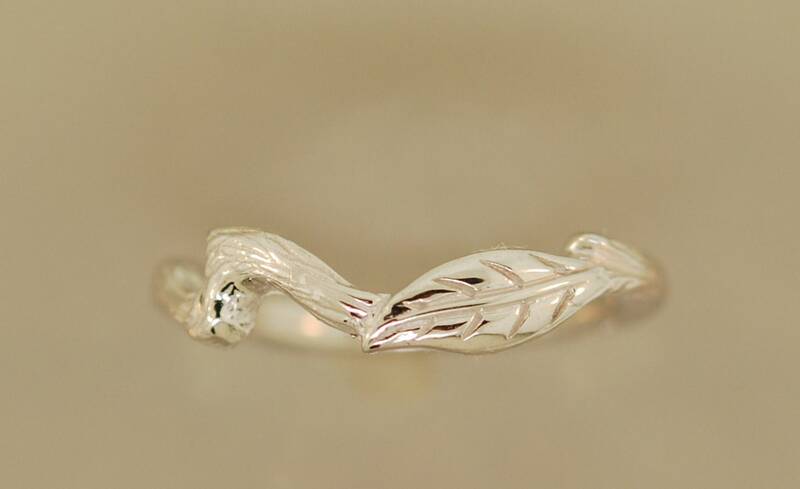 If you want to purchase the leaf ring separately. please email me. I accept paypal and direct payment through Etsy. I will send your item once I receive payment. California residents will be required to pay 9.75% sales tax. I will ship USPS first class mail with delivery confirmation. I go directly to the post office to mail your packages, however I cannot be responsible if they do not make it to your house unless you purchase insurance. If you need an upgrade please let me know and there will be a small up-charge to cover the cost for insurance or priority shipping etc. Please make sure your Etsy address and your Pay Pal address are the same. I will only ship to your confirmed PayPal address unless I am otherwise notified. If your package does not make it to you please let me know. There is a limited amount of time I have to file a claim. If your package does not arrive within 2 weeks for domestic and 4 weeks for international from the day I shipped to you will need to contact me so I can file a claim. I want you to be happy with your purchase. If for some reason you are not please let, me know and I will do my best to resolve the issue. I stand behind my products and will do my best to make sure you are satisfied. Before leaving negative feedback please give me a chance to fix any issues you may have. Since my items are custom made for you in specific sizes, I can not accept returns or exchanges. I do not carry back stock on rings with stones and make them for you when you order. 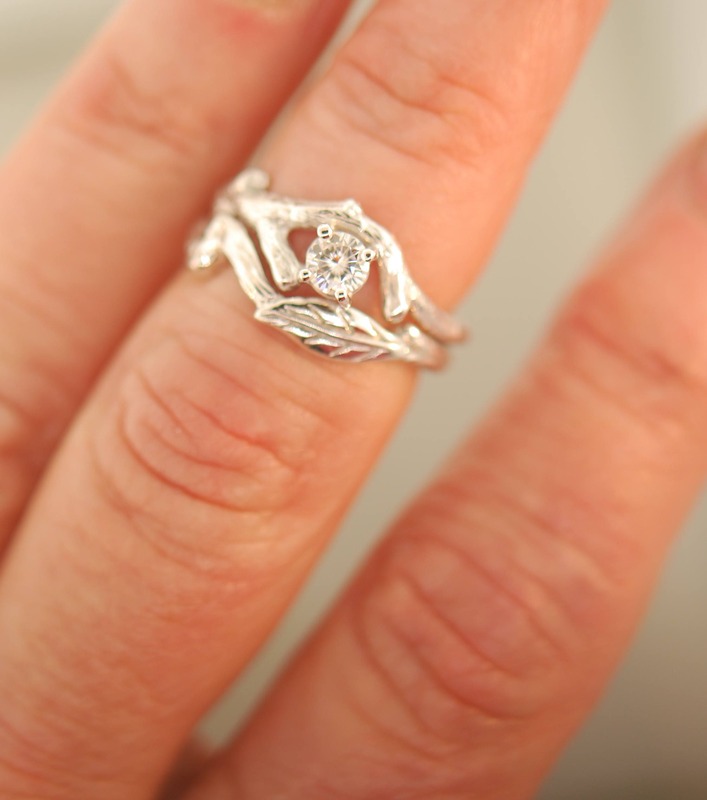 If your ring does not fit, I can resize it for you for a very fair price. If it is my mistake I will fix it for free. If there are any problems with the workmanship I can also fix the item. If I have made a mistake I will also fix the item for free. If you have any concerns regarding an item you are interested in please let me know. Please note I can not be responsible for your shipping charges or if the item gets lost in mail if you choose to exchange so please insure . 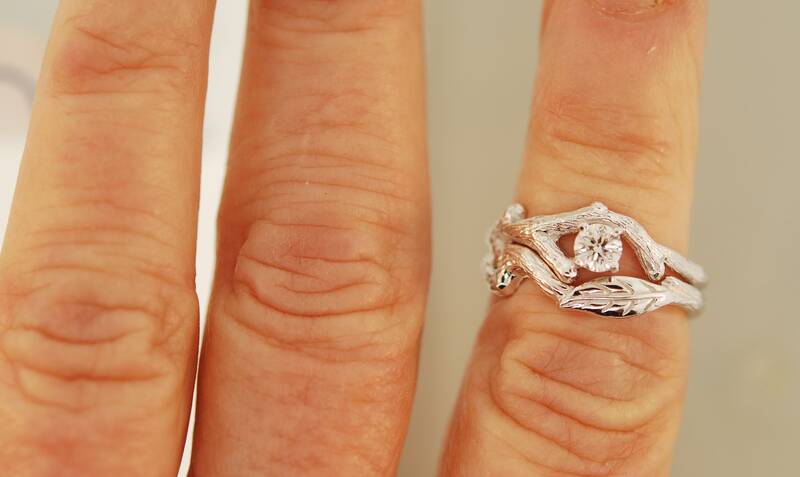 If you need a ring resized there is a charge of 6.00 to 25.00 depending on the job. Please email me if you have any questions or concerns regarding the item you are interested in. If you have a custom order idea please let me know. I am happy to assist you. Special orders are not exchangeable. For purposes of EU data protection law, I, Teri Westerman, am the data controller of your personal information. If you have any questions or concerns, you may contact me at terala123 @ aol.com or through etsy conversations. Please contact me regarding custom orders with stones as these are not returnable. Since I make my items for you when you order one at a time I do not offer returns or exchanges. Also stamped and engraved items are not returnable. If you have any questions regarding your order please contact me regarding exchanges and returns. I recommend you go to a jewelry store to have them size your finger if you are not sure of your size. If I size a ring incorrectly I will comp the resizing. If you need to have a ring resized I can do for this for a fee of 5.00 to 25.00 depending on the job. I ask you to pay shipping for this.